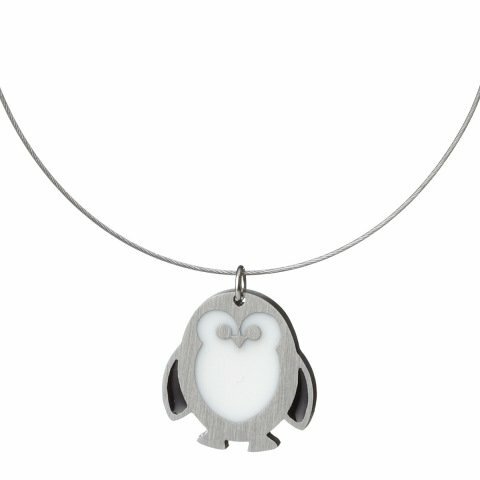 This delightful Penguin Necklace featuring a pleasingly plump penguin makes a delightful pendant to adorn that perfect outfit. A great gift for any woman who is a penguin collector or aficionado. The darling denizen of frozen Antarctica is the cool creation of Kathleen Mattingly Dautel. He will most certainly waddle into your heart. Crafted of laser-cut stainless steel, with an epoxy resin marking that unmistakable penguin tuxedo and the shadow under the wing. Each piece is handmade in North Carolina. Matching earrings are also available. For more information or to order, click here.